I’ve just finished my Tula Pink quilt! This one is going to be auctioned at a charity ball so I felt it need to be fairly striking, having said that I had lots of wobbles making it as the colours are brighter than my usual palette, so I have to give a huge thanks to everyone for your suggestions and encouragement, it kept me going forward! Now it’s finished I like it, yes there are changes I would make with hindsight, but everyone’s reactions to it since I finished it have been positive, so hopefully it will do well on the night. To give a bit of a recap, it’s a free pattern on the Tula Pink website, it’s called Flower Market. 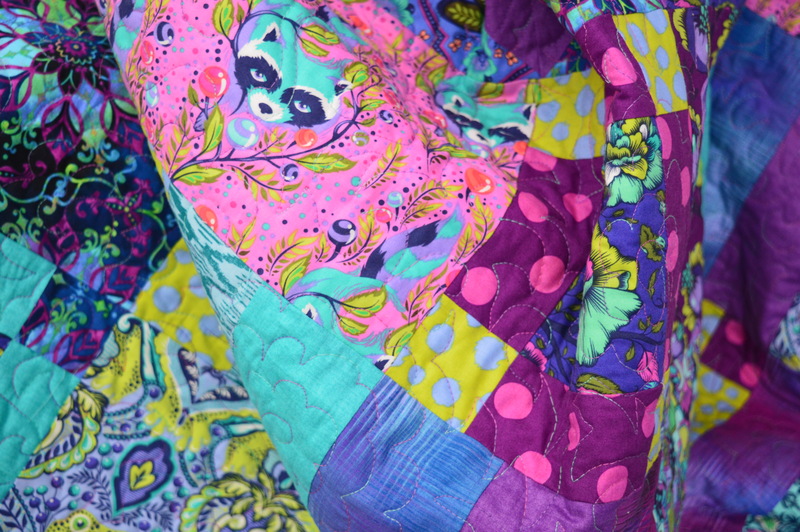 I used predominantly Tula Pink fabrics, so there’s owls, racoons, squirrels, frogs, all sorts hidden within the designs. As a pattern it went together really quickly as some of the pieces are full block or even double block size. Arranging the fabrics and colours was more difficult as I had to fight my usual desire to have the colours fairly co-ordinating, the lime green really makes it pop but I did have to be pushed into using it! I backed it with some plain fabric in a light blue/green colour which pretty well matches one of the fabrics on the front. In some lights it looked a bit bright but it works well now it’s all made up. It’s actually a lot lighter than it looks in the photo, you can see a peep of it in the photo of the quilt folded below. I quilted it using a mixture of flower patterns and foliage of sorts. The flower design is one I found on the internet but I didn’t fancy using it all over so I also used my standard quilting pattern which is like meandering to a point! 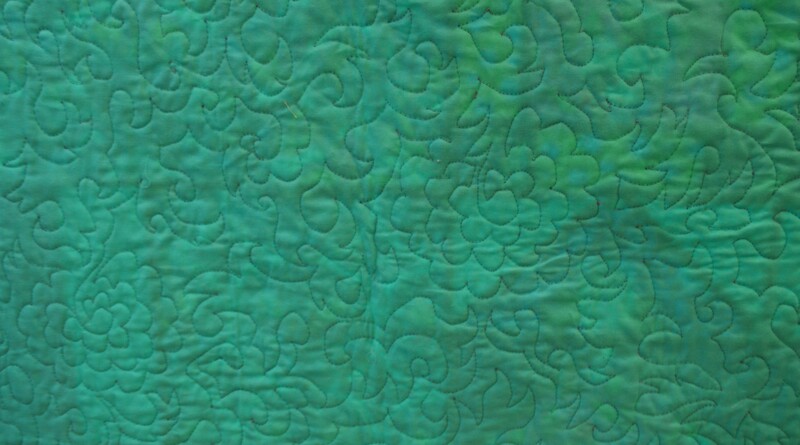 I found when I started free motion quilting that it was when I had to stop that I had a wiggle, so I decided to change direction at that point instead, much easier! My tension still isn’t perfect but it’s improved a lot, I haven’t got any ‘eyelashes’ from going too quick! I used a variegated thread on the top which is purple and green, I think it nicely pulls it all together. The quilt is about 63″ square, so it was a bit of a handful when I was trying to quilt the centre as I’ve only got a standard size sewing machine. I stitched teal green binding on, I always hand-stitch it down which takes quite a while but I’ve never managed to get a neat result with the machine. I understand a lot of quilters really dislike binding a quilt, but I see it as the last stage, it’s almost done and it’s actually quite relaxing. It took a few hours but it’s one of those activities where you can just let your mind wander and day dream away, before you know it you’ve stitched all the way round. I just need to embroider the name of the quilt, my initials and the date on the back and it’s ready to be posted. This entry was posted in Quilting and tagged machine quilting, Market Garden Quilt, Tula Pink quilt. Bookmark the permalink. It’s wonderful! You did a good job with the quilting. That can be a real struggle on a domestic machine. This is just adorable! Well done! This came out really beautifully. The way it all came together is fantastic! I’m sure it will do well at the auction and will be a treasure for whoever gets it. You must be so proud! Bravo, well done at overcoming your reservations about the colours and achieving a really gorgeous result. Nice work on the quilting, too – I’d have taken the easy way out and made a QAYG to avoid the heavy wrangling! very vibrant! hope it does well in the auction! I’m just hoping it’s not too bright! Gorgeous – until you said about the animals I hadn’t seen them – I especially love the owl. You have made a great quilt which I hope raises lots. It looks great, Margaret, and I love you thread choice. 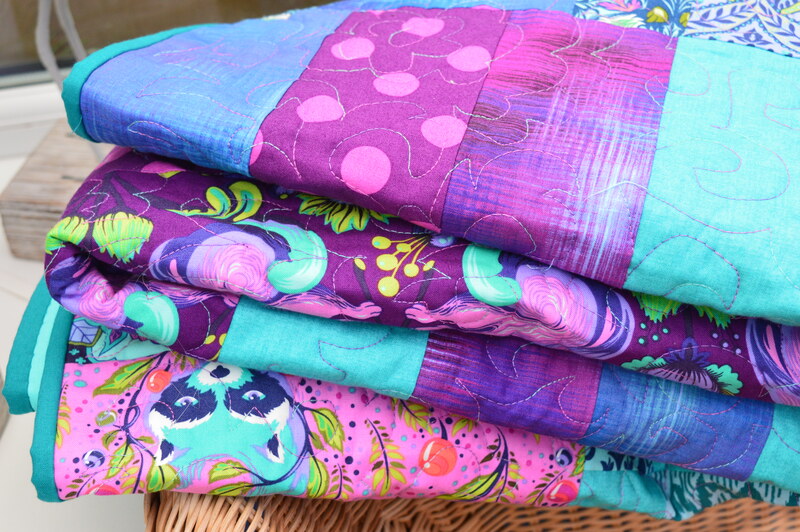 I do my quilting on my domestic machine, too, and I try to make sure I have plenty of recovery time in between quilts. I think this will do very well at the auction, it is so bright and cheery! Those colours really zing, a wonderful quilt. Beautiful! 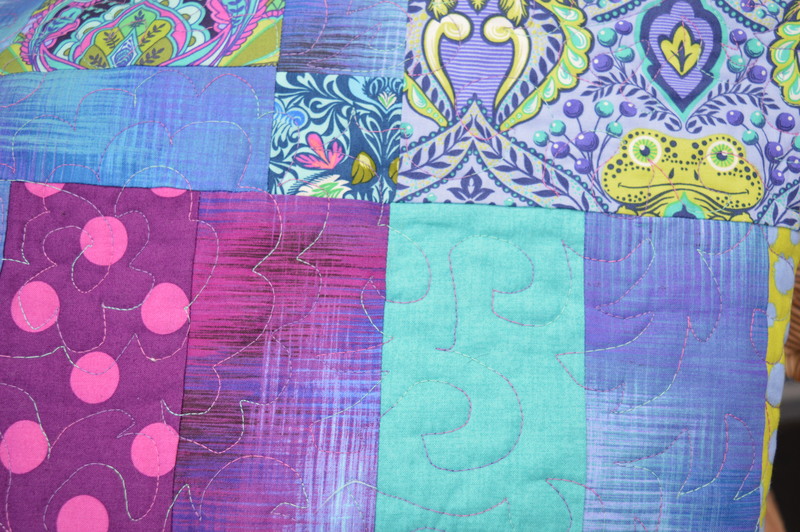 I love the colours and your quilting is amazing! I am a basic quilter, like the piecing but my quilting is a lot (a lot, a lot!) more basic always. It’s a gorgeous quilt! I’m sure it will be a big hit at the auction! I love hand binding too… it’s my favourite! That is so pretty – I love all that color! Your quilting looks wonderful to me. I also like finishing off the binding by hand – it feels like the perfect last step! It’s lovely. I’m sure it will make loads of money. Congratulations! 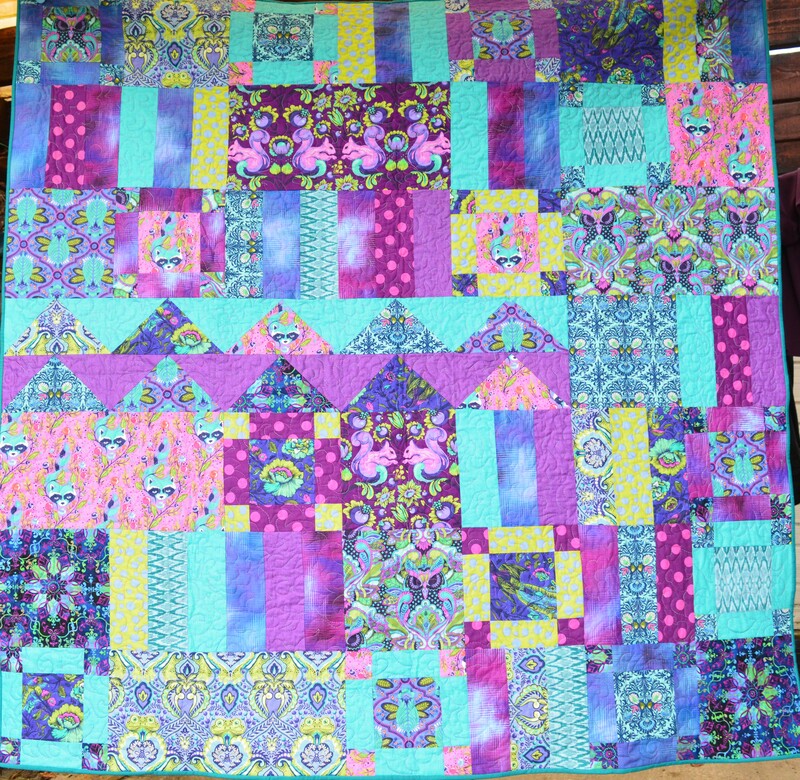 What a cheerful and bright quilt!